We apologize for the follow picture, as it might be triggering. But we’re all friends here, and friends don’t let friends keep uncomfortable, potentially hazardous, bras. It’s time to refresh. 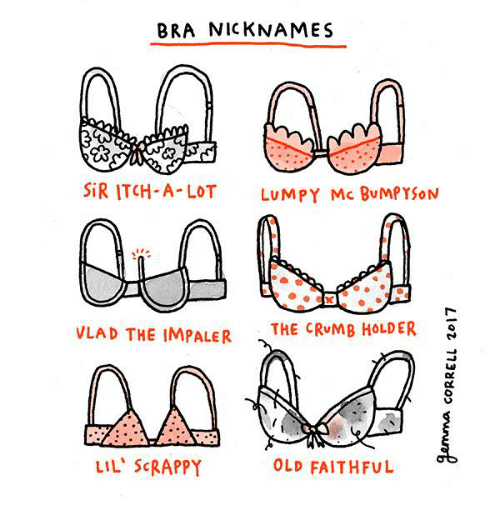 Ditch “Sir itch-a-lot” and stock up the everyday bras that you will actually wear. You buy your razors, toilet paper and sometimes even food in bulk. Make your life that much easier by shopping for bras in the same way. It will save you a bit of cash but more importantly, helps with bra maintenance. Shape up! Allow your cups to rest. That’s right, bras need beauty sleep. The shape of your bras depend on how often you wear them. After a long day of supporting you, the cups need time to reshape themselves. That’s why we don’t recommend wearing the same bra day after day. Adding more to your rotation will help your bras keep their shape and last longer. We recommend washing your bras after 2-3 wears. Good news, all of our bundles come with a bra wash bag. If you aren’t sure how to wash our bras, click here. We know it’s hard to live without your fave bras while they’re in the wash and, when you buy in bulk, you won’t have to. Don’t worry about your bra drawer being empty for long, we have a plan. No wholesale club membership necessary. Buying in bulk makes sense. It’s hard to find the perfect fit, so when you do, stocking up is just good measure. Plus, there’s nothing more satisfying than a fresh stack of everyday bras. Fulfill your bra drawers dreams.